You want to park uphill on a two-way road and there is no curb. Which direction do you turn your front wheels? 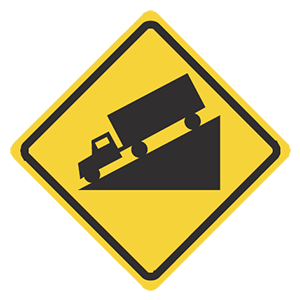 When parking either uphill or downhill on a road that has no curb, you should turn your wheels so that the vehicle will roll away from the center of the road if the brakes fail. Stop before entering the intersection, as long as you can do so safely. Stop. Yield to all cross traffic before crossing the intersection. A flashing yellow traffic signal light warns you to proceed with caution. Slow down and be alert before entering the intersection. Yield to any pedestrians, bicyclists, or vehicles in the intersection. The collision causes $1,000 in damage. You plan on being out of the state for more than 30 days. You refinance the remaining balance of your vehicle loan. If a collision results in death, any minor or major injury, or more than $1,000 in damage to anyone's property, each driver involved must file a report with the DMV within 10 days. In some cases, the driver's insurance agent, broker, or legal representative may file the report to represent the driver. May turn left on a green light when it is safe. 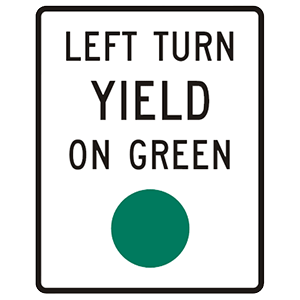 A sign that says to "yield" means that you must slow down and be ready to stop to let any vehicle, bicyclist, or pedestrian pass before you proceed. After yielding, you may follow the remaining directions on the sign. Permitted from the side next to the solid yellow line. Not permitted from either direction. Permitted from the side next to the broken yellow line. When the center of the road is marked by a solid yellow line beside a broken yellow line, passing is permitted from the side next to the broken line and prohibited from the side next to the solid line. You can't get all the way across before the light turns red. The light is flashing yellow and you didn't stop first. The light is yellow and you cannot stop safely. Do not enter an intersection if you cannot get completely across before the traffic signal light turns red. If you block the intersection, you can be cited.